I first asked Marc to tell me where the aircraft are based and what area they cover. He explained that they have 2 aircraft; one at Blackpool and one at Barton and they cover all of the north west of England – from the Lake District down to the north Midlands and from the west coast over to the Yorkshire border in the east. All in all that amounts to 5,500sq miles and approx 8 million people. Marc went on to explain that the maximum travel time to the furthest possible reaches of the area covered would be about 35 minutes so, once the call has been received the team are likely to be with the casualty within half an hour. The helicopter is then usually within 10 minutes flight of the nearest A&E dept. Marc described the operational role of the NWAA as putting medical personnel in position and once the case has been assessed, transferring the casualty to the nearest hospital. 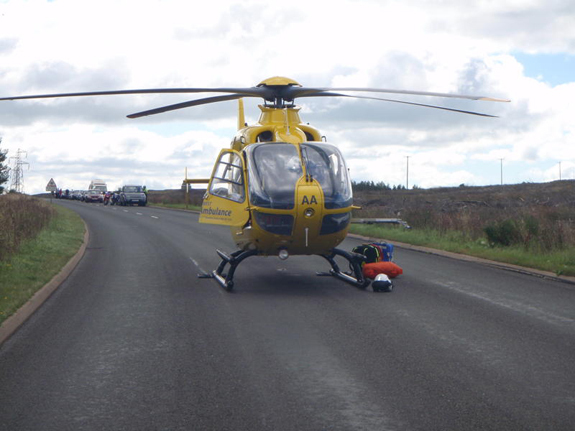 Fairly obviously, the helicopter is usually called out when a conventional ambulance could not get to the scene so it is ideal for access to remote areas but it is primarily used for road traffic accidents where speed of response is critical. The ambulance service use EC135 T2 aircraft with glass cockpits, GPS and 3 axis auto-pilot. The helicopter is IFR capable but the team tend to fly mostly VFR and, unlike the police, during the day only. The crew for a typical operation is one pilot and 2 paramedics. The paramedics have specific HEMS (helicopter emergency medical service) training to enable them to assist with navigation and communications in flight. Marc explained that they are classed as category A when it comes to air traffic control and, as such, have priority when routing around the area. As most flights are conducted at 1000 – 1500 feet they don’t really come into conflict with airline traffic. I asked Marc about the flying statistics for the helicopter. Due to the nature of the operations he said that most flights are only of a few minutes duration. Marc’s current aircraft has done 3,000 hours flight but has done 15,000 landings in its current role. A typical day involves firstly checking the weather for the day, then doing an inspection of the aircraft including checking their dedicated fuel supply. The team then meet up for a pre-operational briefing before settling down to wait for the first call to come through. It sounds to me like the ideal flying job with lots of variety each day but, of course, I was sure that they would have some hairy moments but Marc assured me that he hadn’t had too many stressful moments. Marc’s career had involved flying with the Royal Navy in various roles including search and rescue, submarine hunting and flying the Sea King in an Airborne Early Warning (AEW) role on board Ark Royal. 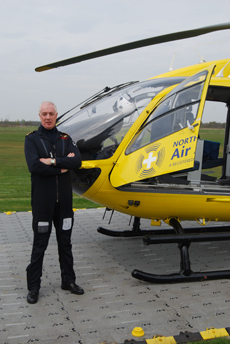 Following a few years flying for the airlines Marc finally got this great job with Bond Helicopters flying for the North West Air Ambulance charity. 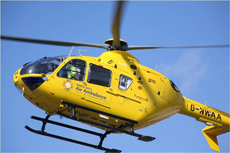 Here are some more details for the North West Air Ambulance charity service. 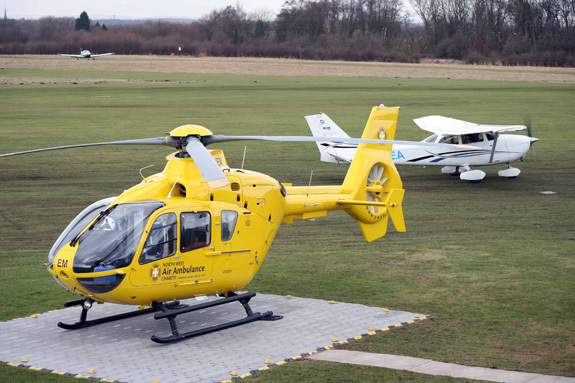 The NWAA service has been in operation for over 10 years now and they operate 365 days a year with at least one of their aircraft being operational from either: Blackpool or City Airport, Manchester. They average 5 incidents a day, rising to 10 a day during summer and as you heard Marc say in the podcast, they cover a huge part of the country. That’s 8 million people and 5,500 sq miles. There are 3 types of response for the aircraft. 3) Tertiary â€“ inter-hospital transfers. Almost half of the call outs are for road traffic accidents, 15% for falls, 9% medical emergencies, 8% sporting and 6% horse riding accidents. The team aim to be airborne within 2 minutes of receiving the emergency call which is very impressive and, although Marc was hesitant about saying how many lives they have saved, it must run in to the 100’s over the years. To keep the service operational costs approx Â£4m per year and most of that money has to come via charitable donations. As part of the team there are 3 pilots, 6 paramedics and a couple of engineers that keep the helicopters flying. This doesn’t include the team of staff and volunteers that are involved in fundraising. If you feel the need to help this very worthwhile charity in some way, you can by either: donating, volunteering or arranging some sort of fundraising event. If you are a member of some sort of club or community group they will even come and do a presentation about the air ambulance service. 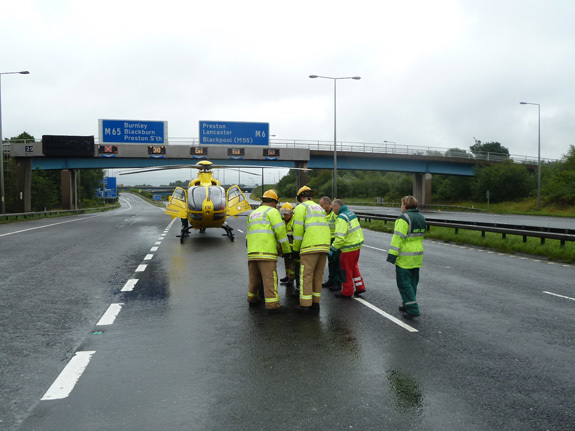 If you would like to help, please have a look at the North West Air Ambulance web site. They really do a brilliant job and they do deserve our support. In episode 37 we featured an offer for the Aware and Aware + GPS systems. Well the offer was such a great success, Airbox have kindly agreed to extend it. So if you’d like to save Â£10 off an Aware or Aware +, including the new 5â€? screen version, just mention Flying Podcast when you order. The offer extends to the first 50 units bought and will expire at the end of April 2011. All you have to do is place your order by calling the Airbox office on 01235 227 250 and mention that you heard about the Airbox Aware or Aware + on Flying Podcast. This entry was posted in All Podcast Episodes, Flying Professionals and tagged Ambulance, General Aviation, Helicopter, Medical, Podcast, podcasts by admin. Bookmark the permalink. Just found the podcast and I’m playing catch up. Great stuff!